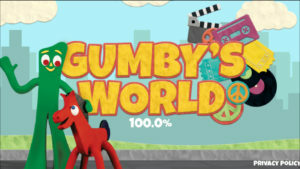 We’re proud to announce the launch of the newest Gumby game app, Gumby’s World. 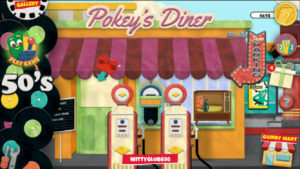 The game will transport you to the Old West, outer space, a carnival, a movie studio, and Kapp’s lab in true Gumby style. Play five different games, collect coins, and watch Gumby episodes and rare video clips along the way. 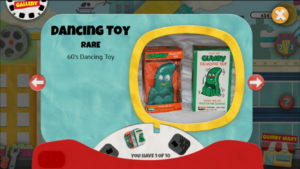 Plus, you can win real Gumby merchandise, including collectibles available only in this game. “It’s fun and engaging for everyone in the family. With a variety of games reminiscent of video games from the past, you’ll be entertained for hours. And there’s the added bonus of winning REAL prizes that are shipped to your home for FREE**, commented Joe Clokey. There are 3 exciting ways you might get a prize mailed to you for free! If you’re very lucky, a random hidden prize notice may just pop­up while your playing! Find the prize in 1 minute and it’s yours! Another way to win is to hit the Treasure Rooms, fill your Viewmaster with collectibles and win the exclusive Trading Cards not found anywhere else on Earth! Finally is the Grand Prize Leaderboard where finishing in 1st, 2nd or 3rd place by earning the most Gumby Coins in a day awards prizes so big and so rare, Gumby can only give them away once a day! Along the way, you can enjoy the sites and pad your pockets with Gumby Coins watching video episodes including rare footage and behind the scenes clips! Play with Gumby, Pokey, the Blockheads, Professor Kapp and your favorite Gumby characters in the Gumby’s World app and get some REAL GUMBY SWAG sent to your house** today! **Game prizes can only be mailed to U.S. addresses. About Premavision, Inc. / Clokey Productions, Inc. Founded by Art and Ruth Clokey, Premavision/Clokey Productions stop motion animation studio is best known for creating the iconic character Gumby—the world’s original clayboy. The studio has produced over 200 Gumby TV episodes and TheGumby Movie, as well as the popular Davey and Goliath show. The company’s productions have aired worldwide for more than 60 years, and the legacy continues under the direction of Joe and Joan Clokey. ThinkU designs and develops exciting games for successful brands combining real products as rewards for gameplay. Partnering specifically with brands that offer real products, ThinkU’s games are designed to put those products directly into the hands of a massive gaming audience. This model increases revenue and lifetime value for the brand, adds life to the products and gives gamers something they have never experienced, real prizes by playing apps and games.